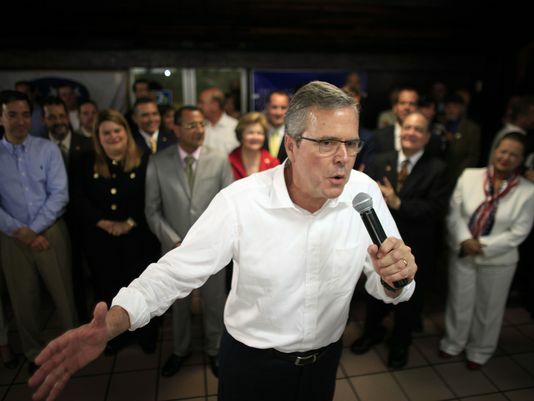 Poll numbers that are not showing Jeb Bush holding a commanding lead amongst the Republican field for 2016 do not bother the former governor of Florida. The polls are irrelevant said Bush during a Fox News interview. He said he has yet to announce any candidacy so the polls really do not matter. Until the race gets closer and the election nears, everyone should remain calmer, said Bush. Bush has not declared his candidacy for the Republican Presidential nomination as of yet, as have a number of his fellow Republican including Senators Rand Paul and Marco Rubio. He said even without making a formal announcement his exploratory efforts have been better than those of Hillary Clinton the leading candidate for the Democrats. He said he attends town hall meetings and does not screen questions with a protective bubble, as does Clinton. He added that he did not have roundtable discussion or town hall meetings where he picks who comes and screen the questions. Bush also said that he was sticking to all his positions on Common Core and immigration. Two issues where he has not always walked side by side with fellow Republicans. He argued for the allowing of immigrants illegally in the U.S. to have a path to legal status though not citizenship necessarily. He also said he was supporting the allowing of young males and females brought to the U.S. as children illegally by their parents to qualify for tuition to instate colleges a position that got former governor of Texas Rick Perry in trouble in the GOP Primer in 2012. Bush said a time comes when we are over the line, and what should we do, marginalize the people forever? Bush suggested as well his willingness to defend the less popular positions that set him apart from his fellow Republicans. On Common Core standards for school, which many voters who are Republicans fiercely oppose, Bush said he respects the view people have, but is firm on his support for those standards. The fact is simple, we need to have higher standards. They need to be from the state, with the federal government not playing any role in it, either in the standards, curriculum or content.